This is a list of diplomatic missions in the United States. At present, 178 nations maintain diplomatic missions to the United States in the capital, Washington, D.C. Eight nations also attribute their missions at the United Nations in New York as their official embassies to the United States. However, only those offices in New York that serve as an official diplomatic mission to the United States are listed here. For a complete list of diplomatic missions to the United Nations, see List of current Permanent Representatives to the United Nations. Only diplomatic missions operated by a foreign country are listed here. Honorary consulates, typically private offices designated to provide limited services on behalf of a foreign country, are not listed. The United States Department of State maintains the official consular list. 1 Embassies in Washington, D.C.
1.1 Other missions/delegations to the United States in Washington, D.C.
1.1.5 Other Posts in Washington, D.C.
Main article: List of diplomatic missions in Washington, D.C. The following 178 countries maintain chanceries (embassy buildings) in Washington, D.C. as their primary diplomatic missions to the United States. Entries marked with an asterisk (*) have chanceries located on or near a portion of Massachusetts Avenue known as Embassy Row. Other missions/delegations to the United States in Washington, D.C. The following countries or entities have missions in Washington, D.C., though they may not have full diplomatic relations with the United States government. Interests sections are provided by protecting powers. The United States does not recognize the following states. Other Posts in Washington, D.C.
New York is home to the General Assembly of the United Nations, and all 195 member and observer states send permanent delegations. Nine diplomatic missions in New York listed below are also formally accredited as each country's official embassy to the United States. There are 117 diplomatic missions in the city. All are consulates-general unless otherwise noted. Los Angeles, the second-largest city in the United States, is home to 66 diplomatic missions, more than any other city on the West Coast and any U.S. city except New York and Washington. Many of these consulates are located along Wilshire Boulevard. Chicago, the third largest city in the United States and the largest in the midwestern region of the country, is home to 51 missions, the fourth-most after Washington, D.C., New York and Los Angeles. Houston is the fourth largest city in the United States and is home to 42 missions. San Francisco is home to 40 missions. Miami is home to 35 diplomatic missions. Due to its location, many Latin American and Caribbean countries maintain consulates there. Atlanta is home to 26 missions. The Boston area of New England is home to 27 foreign missions. Many cities have only one or two consulates; these are often with Mexico (which has 50 offices in the United States), or Canada (which has 17). San Juan, Puerto Rico has eight consulates, seven of which are with Latin American countries. It has the largest number of consulates outside of the Continental United States. Guam is home to five missions, all of which are Asian or Pacific countries. Due to the large number of Mexican immigrants in the United States, Mexico has 50 diplomatic missions in the United States, more than any country has with any other country. Many of these are smaller cities in the southwestern United States, including a number of border towns. 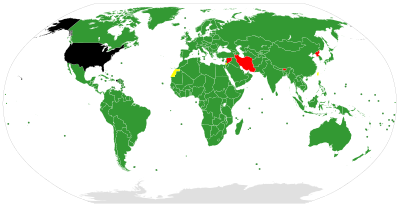 Several countries do not have formal diplomatic missions accredited to the United States. Consular duties for each country, except Kiribati and non-UN members, are instead managed by their respective diplomatic missions to the United Nations in New York. ^ U.S. Department of State. "Foreign Consular Offices in the United States". Retrieved 5 March 2010. ^ McGwin, Kevin (10 January 2014). "Starting from scratch". The Arctic Journal. Retrieved 1 August 2014. ^ "Government". Consular Office of the Republic of Korea in Dallas. Retrieved 2013-08-30. ^ "Government". Embassy of the Republic of the Marshall Islands. Archived from the original on 2015-03-30. Retrieved 2012-07-05. Foreign Embassies and consulates in Washington D.C. This page was last edited on 26 March 2019, at 21:35 (UTC).